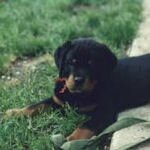 Is a Rottweiler Dog Breed the right Breed for You? Do you need a protective dog that is intelligent and devoted to its owners? If so, you may want to consider buying a Rottweiler. These big dogs were bred to be very versatile working dogs. They guard their homes and families, excel in agility training, and think that they are tiny lapdogs when they are with their owners. The Rottweiler is fairly large and very muscular. These powerful dogs weigh between 85 to 130 pounds and stand 22 to 27 inches tall at the shoulder. A Rottweiler has a sleek black and brown coat and deep, soulful brown eyes. The Rottweiler Dog Breed is a part of the American Kennel Club's Working Group. These powerful dogs are often used as guard dogs. Unfortunately, some Rottweiler owners have mistreated their dogs in an attempt to make them more aggressive. 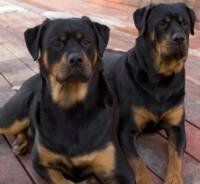 These abused Rottweilers have given the breed an undeserved reputation as a dangerous breed. 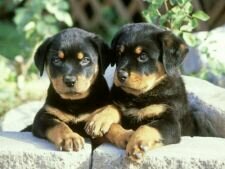 Rottweilers that are bred and raised properly are actually wonderful, loving family pets. They are not the best breed for an apartment. These dogs are big and powerful and they need room to run. Ideally, Rottweiler owners should own a home with a fenced yard. If you do not have a fenced yard, you should be prepared to take your dog for frequent runs in the park to burn off excess energy. 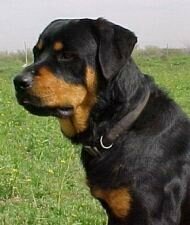 The Rottweiler is an extremely intelligent dog and this breed does best when it has something to do. 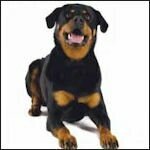 Give your Rottweiler a job, such as keeping pests out of the garden, and you will have a happy dog. It is important to begin training a Rottweiler puppy at a young age, as these dogs quickly grow into large, powerful animals. Also, puppy obedience classes are a wonderful opportunity for you to provide your Rottweiler with plenty of socialization at a young age. Luckily, this breed enjoys learning, as long as the trainer uses love and patience. These dogs respond eagerly to new challenges, which is why the Rottweiler does well in agility trials. Because of their size and strength, Rottweilers may not be the best choice for a family with a toddler. A six month old puppy may not realize his own strength and could accidentally injure small children while he is romping around. If your heart is set on a Rottweiler puppy, you may want to wait until your children are old enough to walk well. Of course, a dog with the size and energy of a Rottweiler can burn up quite a few calories. You should be prepared to buy quite a lot of food for your puppy. Also, it is important to make sure that your puppy's nutritional needs are being met, since Rottweilers can develop joint problems when they are older. Since a Rottweiler has such a short coat, grooming one of these dogs is not very time consuming. Brush your dog once a week with a slicker brush to keep his coat looking shiny and glossy. Also, be sure you take the time to check his nails to be sure they become not too long. When your dog is a puppy, you may also want to accustom him to having his teeth brushed. 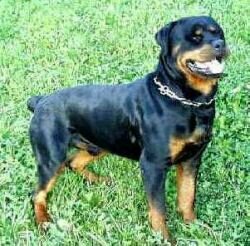 If the thought of having a hundred pound dog attempt to crawl into your lap as though he weighs ten pounds horrifies you, then a Rottweiler may not be the breed for you. After all, not everyone wants a dog who has the appearance of a killer and the heart of a marshmallow.